Conan’s Countdown: Can O’Brien Legitimize Late-Night Basic Cable? We’re just a hair over two weeks away from Conan O’Brien’s triumphant return to late night television in his new talker Conan, but can he lure fans away from the major networks, which have traditionally dominated the wee hours? When Conan announced his departure from NBC after the network’s highly publicized Jay Leno Show debacle, he may have been one of the most sympathetic television personalities in the medium’s history. Conan’s patented style of absurd and self-deprecating humor had grown him a massive following in NBC’s 12:30 slot following Leno, but NBC brass just didn’t feel Conan was delivering at Tonight in the slot previously occupied by Johnny Carson. If any of what I’m saying right now is news to you, welcome back to the planet Earth, astronaut! I’m glad we were able to rescue your lost space capsule and return you home. Cut to: After a long hiatus wherein Conan laid low and kept quiet, most media pundits expected the comic to sign with FOX, which has famously been trying to establish a late night presence for some time. But the winner of the Conan lottery was none other than TBS, which seemed puzzling at the time. Sure, TBS currently hosts The George Lopez Show, but let’s be honest — no one’s really standing around the water cooler on Wednesday morning talking about The George Lopez Show. Outside of this late night offering, TBS programming by and large currently consists of a massive, massive number of Seinfeld, The Office and Family Guy re-runs — yet TBS seems committed to their tagline “Very Funny,” and grabbing Conan was a great feather in that cap. 1.) His fans have to follow him there. The massive outpouring of emotion and support from Conan fans was eye-popping during his last few days of his Tonight show tenure, but let’s just play devil’s advocate here for a moment — how much of Conan’s support was from true, long-time, never-miss-an-episode fans and how much came from bandwagoners? Conan’s was certainly the hip side to take in the NBC squabble, after all, and if Conan had this much support all along, wouldn’t his Tonight ratings have been better? If he’d had this massive outpouring of support at 11:30 on NBC, he’d never have been called on the carpet at all. I’m not saying Conan doesn’t have his fans, but I’m pointing the finger at you, bored, Facebook-loving hipsters: put your money where your mouth is and support the man you claimed to love so much. You have to watch the show, not just hit the “like” button. 2.) TBS has to change the public’s perception of basic cable hipness, and the critics have to help. Basic cable at this point in history is bigger than ever before, but the major networks remain king. DVR has likely made super-hits out of otherwise missable basic cable shows (I’m sure, for instance, that the DVR numbers for guilty-pleasure shows like Jersey Shore or Project Runway are massive, and it’s been documented that much of Mad Men‘s success has been DVR-centric), but it’s going to be tough to convince the general public to switch over after their local news. The best help Conan has on this point is the giant following of The Daily Show and The Colbert Report — both of which are wildly popular and successful shows which have struck as arrows in the heart of late night network TV — but don’t forget that Conan’s going to be competing against both at 11:00 on TBS, which could dilute the pool of the percentage who do move to basic cable for their late night television. It’s up to both TBS to push Conan (which they are, especially during their MLB playoff coverage) and for critics who laud Conan O’Brien to talk him up. 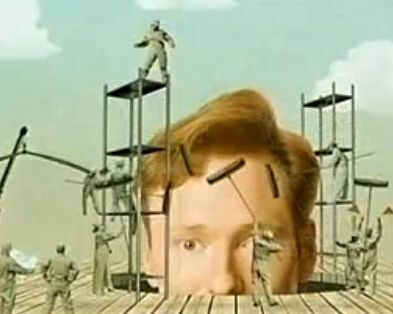 The decision to move to TBS was an interesting one for Conan O’Brien, to be sure. But it could prove to be a shrewd one — as TBS allows Conan to build his show however he wants, gives him the freedom to continue his post-modern sensibilities and grants him complete ownership, Conan could at the very least begin as a must-watch and move mightily into cult status (which also isn’t terrible, in the end). His first week guests will reportedly include Tom Hanks, Michael Cera, Jon Hamm and Jack White, which proves that Conan’s celebrity pals are still standing firmly behind him, and pal/sidekick Andy Richter will return as well (bandleader Max Weinberg, sadly, has declined the new outing). So it would seem all the elements are in place for a Conan success. The material will be there, the guests will be there, and Conan seems more rejuvenated and raring to go than he’s ever been — with a lot to prove. The question in my mind is: can TBS handle it? You’re in the big leagues now, Superstation. Play this hand well and it could put you on the map for good. Let it slide and you’ll have squandered the greatest opportunity to fall in your lap — and proven further the argument against basic cable.